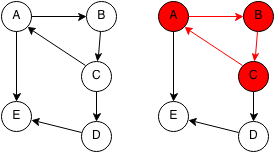 A cycle occurs in a graph when a duplicate node is encountered when traversing a tree using a depth first search. In other words, a cycle occurs when you can reach the same node through a path in a graph. An undirected graph where the number of edges is greater than or equal to the number of nodes will always have cycles. We first mark every node as unvisited. We start at each unvisited node and we do a depth first search from that node. We mark each node along the way as temporarily visited and if we encounter a temporarily visited node, then we have a cycle. After temporarily visiting the nodes, we mark them as visited. If we reach a visited node again, then we stop since we already checked if that node had a cycle. // Mark each node as unvisited. // Check if current node leads to a cycle. // If node has been reached again from the starting node, we have a cycle. // If node has been permanently visited, we know it was already checked. // Mark node as temporarily visited. // Iterate through neighbors of current node. // Permanently mark node as visited.